I am delighted to share encouraging feedback from a talented beauty queen! 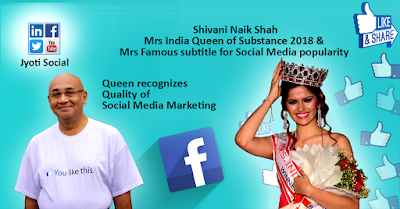 "Hi, this is Mrs. Shivani Naik Shah, Mrs India Queen of Substance 2018.
weeks for social media promotion of my facebook page. like to extend my thanks to each and every member of the team. me bag the sub title of Mrs Famous as well. 24*7 availability to address any queries. and his Jyoti Social team. Whatsapp Jyoti Zaveri +91 9552946949 and get your appropriate Online Branding! Superb. I really enjoyed very much with this article here.